Josh Jacobs couldn't help but admire this bucket-truck storrowing on Soldiers Field Road at North Harvard Street shortly before 9:30 a.m.
H/t ThatGuy for the headline. Trillium Brewing Co. today released a beer called Storrowed. Read more. During rush hour on one of the busiest travel days of the year, a driver for Bob's Furniture decided to get on Storrow Drive outbound. It did not end well, at least for all the other drivers behind him. The Bob's guy, at least, did manage to stop before he storrowed his truck to smithereens at the BU Bridge. Read more. Take note, kids: THIS is how you storrow a truck. A little late for this semester, aren't we? Rebecca found herself behind a wayward U-Haul on Storrow Drive inbound shortly after 12:30 p.m. today. A truck carrying one of those POD things became a truck carrying pieces of one of those POD things this afternoon when its driver decided what the hell and took Storrow Drive westbound, at least until the top of his POD got destroyed by the BU Bridge. Read more. 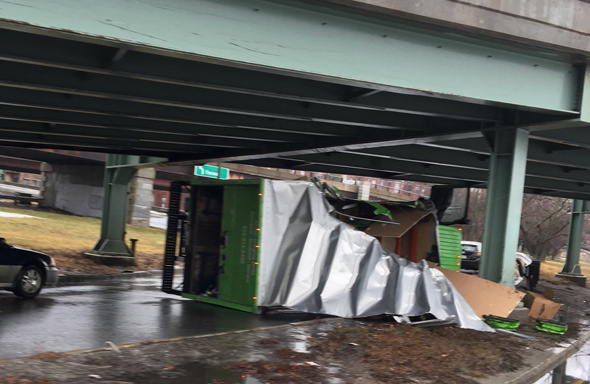 Rick came across a freshly storrowed box truck being towed off Storrow Drive this afternoon after having an intimate moment with a footbridge. Well, what do you know? There were several close calls, but no actual storrowings this weekend on either river road, at least as far as we could tell. One of the close calls came late tonight, when the driver of a Stop & Shop 18-wheeler, who you really would think would know better, started to turn towards Storrow Drive, before realizing the goof and backing up, as Ari Ofsevit shows us. Rick Macomber chronicled a storrowing, shortly after 2 a.m. on the inbound side at the Longfellow. 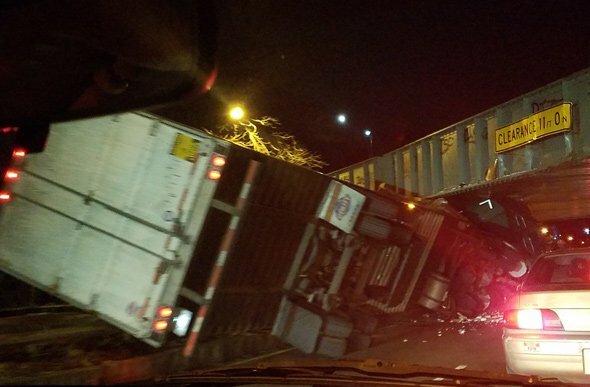 The driver of this truck didn't shred it while making a run for Storrow Drive near Mass. Eye and Ear this morning. Shamus Moynihan provides the evidence. State and Boston Police had to shut the ramp while the driver backed up and awaited his obligatory ticket. Kevin couldn't help but notice the flipped, storrowed box truck outbound by the Fenway/Kenmore exit on Storrow Drive around 5 p.m. (although seems the flipping happened a little after 4). 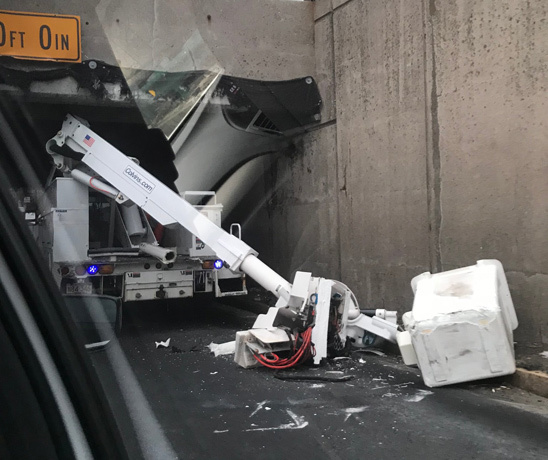 Josh Oberler shows us what he saw when a camper driver backed up after realizing there was no way forward for him or her on Storrow inbound this afternoon. Lilac Scoring forwards a couple of photos of some height impedance leading to some boffo storrowing on Memorial Drive at Mass. Ave. this afternoon. Read more. Marcela Garcia watched the events unfold today. I-93 strewn with fresh wreckage. Machine on trailer, hit overpass, I-93 SB at x.3 in #Canton. No injuries. Left lane open.